Unsplash/Annie SprattAn arm tattoo is ok. Forehead, not so much. One in five Americans has a tattoo. While ink is more mainstream than ever, face and neck tattoos are still no-gos at work. Hand tattoos are becoming accepted in the most progressive fields, like creative or tech industries. Although it’s still in your best interest to cover up your tattoos during the interview process, it’s pretty unlikely that a “standard” body tattoo alone would disqualify you for the job. It’s also unlikely that ink would ruffle many feathers once you’ve already been hired, human resources consultant Laurie Ruettimann told Business Insider. But there are two types of tattoos that aren’t likely to fly: face and neck tattoos. Ruettimann said those tattoos will likely disqualify you from jobs where you’ll be meeting clients in particular. Marc Cenedella, founder and CEO of career website Ladders, agreed. “Face tattoos are almost always a non-starter outside of hourly work,” he said. Tattoos, in general, are becoming more mainstream; one in five Americans has one. But tattoos above the neckline retain a non-professional air. Anna Felicity Friedman, a scholar who runs the website Tattoo Historian, told The New York Times in a recent article that face tattoos are gaining popularity among musicians because they’re so shocking. Less controversial, but still questionable, is the hand tattoo. Just like any other ink, how your coworkers perceive it depends on how progressive your industry is. “At a law firm, people maybe will notice (a hand tattoo) more than at a tech firm where let’s say nine out of 10 people already have tattoos,” Vicki Salemi, a career expert at Monster.com, told The Wall Street Journal. Whether the ink is on your face or secreted away on your ankle, few executives nowadays are tattooed. It’s important to keep any tattoos hidden when shooting for higher-up roles. “The higher you go in your career the more scrutinised your appearance will be, regardless of industry,” Cenedella said. That being said, the resistance to super-visible ink may soon change. Younger Americans are more likely than previous generations to be tattooed and accepting of ink. Nearly 40% of those aged 18 to 29 have one. 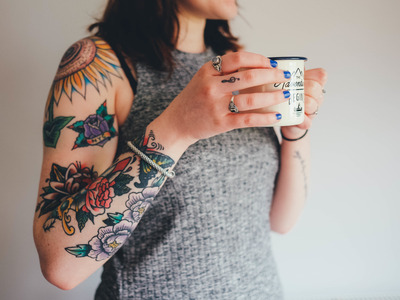 Less than a quarter of millennials say tattoos are unprofessional, compared to 63% of those 60 and older.